Dendritic cells (DCs) are central to T cell immunity, and many strategies have been used to manipulate DCs to modify immune responses. We investigated the effects of antioxidants ascorbate (vitamin C) and α-tocopherol (vitamin E) on DC phenotype and function. Vitamins C and E are both antioxidants, and concurrent use results in a nonadditive activity. We have demonstrated that DC treated with these antioxidants are resistant to phenotypic and functional changes following stimulation with proinflammatory cytokines. Following treatment, the levels of intracellular oxygen radical species were reduced, and the protein kinase RNA-regulated, eukaryotic translation initiation factor 2α, NF-κB, protein kinase C, and p38 MAPK pathways could not be activated following inflammatory agent stimulation. We went on to show that allogeneic T cells (including CD4+CD45RO, CD4+CD45RA, and CD4+CD25− subsets) were anergized following exposure to vitamin-treated DCs, and secreted higher levels of Th2 cytokines and IL-10 than cells incubated with control DCs. These anergic T cells act as regulatory T cells in a contact-dependent manner that is not dependent on IL-4, IL-5, IL-10, IL-13, and TGF-β. These data indicate that vitamin C- and E-treated DC might be useful for the induction of tolerance to allo- or autoantigens. Dietary antioxidants (e.g., vitamin E (including α-tocopherol (α-TOH),7 vitamin C, β-carotene, and selenium), as well as endogenous antioxidant mechanisms, can help maintain an appropriate balance between the desirable and undesirable cellular effects of reactive oxygen species (ROS). Vitamin E was discovered as a micronutrient that is indispensable for reproduction in female rats (1). In humans, vitamin E deficiency can result in various neurological lesions (2, 3). Vitamin C (ascorbate) has long been recognized as being an essential vitamin, with deficiency resulting in scurvy. A large number of clinical studies have been conducted in healthy individuals, populations at risk for certain diseases, and patients undergoing disease therapy to determine whether supplementation with vitamin C or E can result in changes in either oxidative status, disease risk, or disease outcome (4, 5). Vitamin E does not act in isolation from other antioxidants; rather, it is part of an interlinking set of redox antioxidant cycles, which has been termed the antioxidant network (6). Vitamin E is efficiently reduced from its free radical form (tocotrienoxyl or tocopheroxyl) that arises after quenching lipid radicals to return back to its native state (tocotrienol and tocopherol) by vitamin C. Vitamin C can regenerate vitamin E directly, while thiol antioxidants, such as glutathione and lipoic acid, can also regenerate vitamin E indirectly via vitamin C. Under conditions in which these systems act to keep the steady state concentration of vitamin E radicals low, the loss or consumption of vitamin E is prevented. It has been reported that the concurrent use of vitamin C can augment the effect of vitamin E (7) in the treatment of cardiovascular (8), neurological diseases (9), and chronic transplant rejection (10). For these reasons, we used combinations of vitamins C and E (in the form of α-TOH) when investigating their antioxidant effect on dendritic cells (DCs). DCs are the most potent professional APCs and are involved in the collaboration between innate and adaptive immunity (11, 12). The consequence of DC interaction with T cells is dependent on the activation status of both the T cell and the DC. Thus, DCs activated through pattern recognition, TLRs, or inflammatory cytokines are very efficient at activating Ag-specific T cells (11). However, immature DCs (iDCs), which express only low levels of costimulatory molecules, induce anergy in Ag-specific T cells (13). These anergic T cells can in turn act as regulatory cells, suppressing the response of other T cells (14, 15). In the treatment of transplant rejection and autoimmunity, the induction of DC-mediated tolerance would be advantageous (16). Many approaches have been shown to be effective in generating tolerogenic DCs. Abs and fusion proteins have been used to block MHC class II and costimulatory molecules on the surface of the DC (17). Drugs such as dexamethasone (DEX) (18), vitamin D (19), and NF-κB inhibitors (20), as well as cytokines such as IL-10 (21, 22) and TGF-β (22) can generate tolerogenic DCs. The activation of DC is associated with the NF-κB pathway. In various cell types, antioxidants inhibit the NF-κB pathway by blocking the protein kinase RNA-regulated (PKR) protein, protein kinase C (PKC), and p38 MAPK pathways. Oxidative stress has been implicated in the activation of DCs (23), and addition of the antioxidant N-acetyl-l-cysteine has been shown to induce tolerogenic DC (24). We have therefore investigated the effects of vitamin C and α-TOH on these activation pathways, as well as their ability to induce a tolerogenic phenotype for DCs. All reagents were purchased from Sigma-Aldrich, unless stated otherwise. The α-TOH was prepared in DMSO, as previously described (25). Unless otherwise stated, DCs were treated with 500 μM α-TOH in DMSO and water-soluble ascorbate (vitamin C) (10 mM). For comparison, some DCs were treated with DEX (5 × 10−8 M), a proteasome inhibitor, N-benzyloxycarbonyl-Ile-Glu(O-tert-butyl)-Ala-leucinal (PSI) (Calbiochem) (10 μM) (20), and SN50 (20 μM) (Calbiochem) (26), as previously described, for 24 h. All concentrations used were previously optimized. Human DC were generated from peripheral blood monocytes by treatment with GM-CSF and IL-4, as described (27). PBMC were isolated from buffy coat preparation of healthy donors by Ficoll-Hypaque centrifugation (density of 1.077 g/cm3), followed by anti-CD14 bead selection. The nonadherent cell fraction was used for T cell isolation, as described below. To obtain iDC, adherent cells were cultured in X-VIVO 10 medium (BioWhittaker) containing 10% human serum, 2 mM l-glutamine (Invitrogen Life Technologies), and 100 U/ml penicillin and streptomycin (Invitrogen Life Technologies) in the presence of GM-CSF (20 ng/ml) (Firstlink) and IL-4 (20 ng/ml) (Firstlink) at 37°C in 5% CO2 atmosphere for 5–10 days. When appropriate, DCs were given an activation stimulus by incubation in 20 ng/ml IL-1β (PeproTech), 20 ng/ml IL-6 (PeproTech), 20 ng/ml TNF-α (PeproTech), 20 ng/ml LPS, 10 ng/ml PGE2, and 20 ng/ml IFN-γ (PeproTech) for 24 h.
The DCs were cultured for 2 days before addition of vitamin C and α-TOH to the cultures. The cells were then cultured for 3 more days before stimulation, as described above, for 48 h. The cells were then stained with Abs for flow cytometry analysis, as previously described (28, 29). RT-PCR of MHC II, CD40, CD80, CD86, ICOS ligand, and FoxP3 were conducted using paired primers and protocols, as previously described (28, 29, 30). The Western blots for these molecules were conducted, as previously described (28, 29). 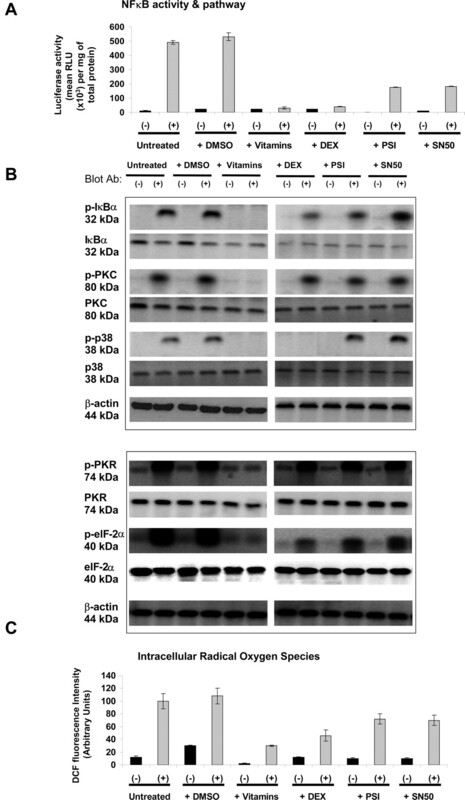 Western blot analysis of phosphorylated and total IκBα, p38-MAPK, PKC, PKR, and eukaryotic translation initiation factor 2α (elF-2α) was conducted using Abs and protocols previously described (31, 32, 33). Programmed cell death ligand 1 (PD-L1) expression was detected with Western blot, as previously described (28), using mAb (e-Bioscience). Detection of early apoptotic cells was performed by means of the annexin V-PI detection kit (BD Biosciences), as previously described (34). Briefly, 106 treated DCs (on day 6) were washed with DMEM, incubated in the dark at 4°C with Annexin VFITC and PI for 15 min, and then analyzed by dual-color flow cytometry. Cells that were Annexin VFITC positive (indicating translocation of phosphatidylserine from the inner to the outer leaflet of the plasma membrane) and PI negative (with intact cellular membrane) were considered early apoptotic cells. The 2′7′-dichlorofluorescin (DCF) diacetate was used for measurement of free radical scavenging capacity, as previously described (35). DCF is a cell-permeable indicator for ROS that is nonfluorescent until the acetate groups are removed by intracellular esterases and oxidation occurs within the cell. DC cultured on 96-well plates were incubated with 5 μM DCF (Molecular Probes) for 30 min at 37°C. Cells were then incubated in 15 mM HEPES (pH 7.4), 140 mmol/L NaCl, 5 mM KCl, 0.3 mM MgCl2, 10 mM glucose, and 10 mM CaCl2. DCF fluorescence intensity was recorded. NF-κB activity was measured using a NF-κB luciferase reporter adenovirus containing four tandem copies of the κ enhancer element located upstream of the firefly luciferase gene (36). This was provided by P. McCray, Jr. (University of Iowa, Iowa City, IA). The Ad preparation and infectivity protocols were as previously described (29, 34). Luciferase activity was determined as previously described (37). MLRs were conducted as described (28). Various T cells were purified, as previously described, using magnetic beads (28, 29). For investigation into the induction of anergy by treated DCs, MLRs were performed using DC as stimulators, after which the T cells were then Ficoll purified and rested. On the second day of resting, the T cells were rechallenged with allogeneic DCs from the same donor as the original DCs. Challenge with allogeneic third party DCs was used as a control. The cultures were pulsed with [3H]thymidine after 48 h, and proliferation was measured. To determine whether CD4+ T cells cultured with tolerogenic DCs developed into a population of cells that were capable of regulating autologous T cells, CD4+ T cells were purified and stimulated with DC treated with various methods in a primary MLR at a 1:4 DC:T cell ratio in 48-well plates. After 5 days, the T cells were recovered by layering over Ficoll-Paque, and then rested at a concentration of 1.5 × 106/500 μl in RPMI 1640/10% human serum. After 2 days, fresh autologous CD4+ T cells (frozen at the time of original culture) were stimulated with irradiated allogeneic DC (either from original donor frozen at the time of the primary culture, referred to as allogeneic same donor DC, or with allogeneic third party DC derived from a different donor). Rested CD4+ T cells from the primary culture, which had also been irradiated, were then added to this culture. Numbers of cells used were 1 × 104 and 2 × 104 for the DCs and responder CD4+ T cells, respectively, and 2 × 104, 5 × 104, and 1 × 105 for the regulatory T cells. The final culture was conducted in 96-well round-bottom plates, and proliferation was measured by [3H]thymidine incorporation after 5 days. To determine the importance to the regulatory phenomenon of cell contact between the regulatory and responder T cells, regulatory experiments were conducted with these two cell types separated in a transwell system. The transwells (BD Biosciences) had a pore size of 0.4 μm, and were used in 24-well plates. DCs and responder T cells were placed in the lower chamber in all cases. Regulatory cells were then added to either the lower chamber or to the transwell insert. In the latter case, DCs were also added to the upper well with the regulatory cells. On day 5, the contents of the lower chamber were transferred to a 96-well plate, in which proliferation of the responder T cells was measured by [3H]thymidine incorporation. Experiments with the neutralizing Ab were conducted, as previously described (38). To determine cytokine production, ELISAs for IFN-γ, IL-4, IL-10, IL-12, and IL-13 were conducted, as previously described (29, 34). IL-1β, IL-5, IL-6, IL-8, and TNF-α were measured using ELISA kits (R&D Systems). Supernatants were obtained either from MLRs between DC and allogeneic T cells on day 4 or from DC cultures 24 h after stimulation with the activation mixture of agents. Statistical evaluation of data was performed with Student’s t test for simple comparison between two means. For multiple comparisons, results were analyzed by ANOVA. Value of p < 0.05 was considered statistically significant. To determine the effect of vitamins C and E alone, or in combination, on the phenotype of DC, monocytes were differentiated into DC with a combination of GM-CSF and IL-4. Varying concentrations of vitamin C or E were added to the cultures from day 2. On day 5, the cells were stimulated with a mixture of proinflammatory agents (20 ng/ml IL-1β, 20 ng/ml TNF-α, 20 ng/ml IL-6, 20 ng/ml LPS, 10 ng/ml PGE2, and 20 ng/ml IFN-γ), and the surface phenotype of the cells was determined on day 6 (Fig. 1⇓). DC that were stimulated in the absence of vitamins were activated, as indicated, by an up-regulation of HLA-DR, CD40, CD80, and CD86 expression, as expected. Incubation of DC with high concentrations of either vitamin C or vitamin E alone reduced up-regulation of expression of these surface markers. Curiously, low (0.01–0.1 mM) concentrations of vitamin E appeared to increase the expression of these molecules following stimulation. However, combinations of the two vitamins were considerably more effective at preventing DC activation, with expression of HLA-DR, CD40, CD80, and CD86 (following stimulation) being similar to that seen in unstimulated control DC. Interaction analysis was performed in which DC were incubated with a range of vitamin E concentrations in the presence or absence of 1 mM vitamin C, and the expression of surface molecules was measured. There was evidence of a significant interaction (p < 0.05, two-way factor with interaction ANOVA) for all four surface molecules (HLA-DR, CD40, CD80, CD86) (data not shown). Optimization of vitamin C and α-TOH in inhibiting the expression of MHC class II, costimulatory molecule expression, and cytokine production. DCs were treated with vitamin C and α-TOH at various concentrations as indicated from day 2 in the presence of GM-CSF and IL-4. On day 5, the cells were stimulated with 20 ng/ml IL-1β, 20 ng/ml TNF-α, 20 ng/ml IL-6, 20 ng/ml LPS, 10 ng/ml PGE2, and 20 ng/ml IFN-γ for 24 h or left unstimulated (iDC). A, Cells were analyzed for surface expression of MHC class II, CD40, CD80, and CD86 using flow cytometry. The results are expressed as the relative fluorescence intensity (normalized to isotype control staining). B, The supernatants from DC cultures were collected on day 7 after the removal of stimulatory medium on day 6. The levels of IL-1β, TNF-α, IL-12, and IFN-γ were determined using ELISA. The data shown are representative of at least three experiments and show the mean ± SD of triplicate determinations. Statistical comparison was conducted using a paired t test to compare expression/secretion of unmodified mDC and vitamin-modified DC (∗, combination of vitamins C and E; ‡, for vitamin E; and §, for vitamin C). The symbols indicate the lowest concentration at which significance was seen; treatment with all higher concentrations of the vitamins also resulted in significant differences. Cytokine secretion was measured in DCs incubated with vitamins (after washing out the activating agents). As shown in Fig. 1⇑, the secretion of IL-1β and TNF-α in response to stimulation by the mixture of agents was reduced following preincubation with high concentrations of either vitamin C or E on their own or a combination of the two. 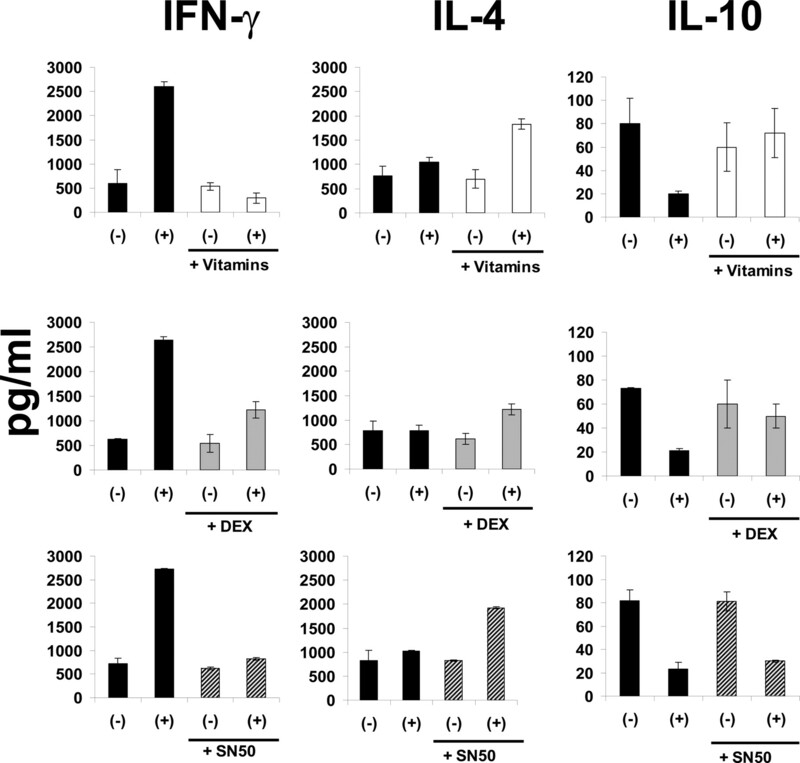 For IL-1β and IFN-γ, there is no difference in the response of DC to vitamin C and to the combination of vitamins C and E. However, in the case of IL-12 and TNF-α, both vitamins together have a greater effect than either vitamin on its own or the additive effect of both vitamins (Fig. 1⇑). One possibility is that the incubation of the monocytes on day 2 with vitamins had blocked their differentiation into DC. However, this is not likely, as the vitamin-treated cells were no longer CD14+ (data not shown). It should be noted that addition of vitamins in the culture before day 2 did result in a small population of cells that remained CD14+, indicating that their differentiation from monocytes to DC had been blocked. We also assessed the effect of adding the vitamins at different times. Similar inhibition of activation (as determined by expression of HLA-DR, CD40, CD80, and CD86) was seen when the combination of vitamins was added 72 or 48 h before activation (days 2 and 3 of culture). Although less marked, there was still a substantial inhibition of activation when the vitamins were added on day 4, which was greatly reduced when they were added 12 h before stimulation, and not seen at all when added either 6 h before or any time after stimulation (data not shown). The effect of exposure to a combination of vitamins C and E (10 and 0.5 mM, respectively) was compared with incubation with DEX and NF-κB inhibitors. As described above, vitamin-treated DC were resistant to subsequent activation by proinflammatory agents (20 ng/ml IL-1β, 20 ng/ml TNF-α, 20 ng/ml IL-6, 20 ng/ml LPS, 10 ng/ml PGE2, and 20 ng/ml IFN-γ). They failed to up-regulate expression of HLA-DRα, CD40, CD80, and CD86 as analyzed by flow cytometry for surface expression (Fig. 2⇓A) and Western blots for total protein expression (data not shown). This blockade in expression was at the mRNA level, as indicated by RT-PCR analysis (data not shown). Treatment with DEX and the NF-κB inhibitors PSI and SN50 also inhibited the MHC class II and costimulatory molecule expression in a similar manner to vitamin C and α-TOH. Comparison of the effect of vitamins on DC with that of dexamethasone and NF-κB inhibitors. DCs were treated with vitamin C and α-TOH, DEX, PSI, or SN50 from day 2 in the presence of GM-CSF and IL-4. On day 5, the cells were either stimulated with 20 ng/ml IL-1β, 20 ng/ml TNF-α, 20 ng/ml IL-6, 20 ng/ml LPS, 10 ng/ml PGE2, and 20 ng/ml IFN-γ (+) or left unstimulated (−) for 24 h. A, The cells were analyzed for surface expression of MHC class II, CD40, CD80, and CD86 using flow cytometry. The results are expressed as the relative fluorescence intensity (normalized to isotype control staining). B, The supernatants from DC cultures were collected on day 7 after the removal of stimulatory medium on day 6. The levels of IL-1β, TNF-α, IL-12, and IFN-γ were determined using ELISA. The data shown are representative of at least three experiments. ∗, p < 0.05 when ANOVA analysis was conducted to compare unmodified DC with vitamin-treated DC, DEX-treated DC, PSI-treated DC, or SN50-treated DC (either + or −, as indicated). §, p < 0.05 when paired t test was conducted to compare unmodified DC with vitamin-treated DC (either + or −, as indicated). Cytokine secretion by DCs (with and without stimulation) was also compared. As previously reported, DCs exposed to DEX produced lower amounts of IL-1β, TNF-α, IL-8 (data not shown), and IL-12 (Fig. 2⇑B), but normal amounts of IFN-γ (Fig. 2⇑B) (39, 40). Following vitamin treatment, Th1 cytokine production (IL-12 and IFN-γ) (Fig. 2⇑B) was reduced both in stimulated and unstimulated DC. Previous data have shown that thiol-based antioxidants can reduce secretion of IL-12 by interfering in heterodimer formation (24). Secretion of IL-1β, TNF-α (Fig. 2⇑B), and IL-8 (data not shown) was lowered in vitamin-treated DCs, as might be expected given the similar response of vitamin E-treated monocytes (41, 42). When DCs were treated with NF-κB inhibitors, a reduced secretion of IL-1β, TNF-α, and IL-12 was also seen both with and without stimulation, consistent with a role for NF-κB in transcriptional control of these cytokines (Fig. 2⇑B). There was a statistically significant reduction in IL-6 secretion on activation with the mixture of stimulators in the presence of vitamins C and E, but the magnitude of the reduction is small (data not shown). There was no statistically significant reduction of IL-6 under the same conditions with NF-κB inhibitors (data not shown). However, when DCs were treated with LPS only, inhibition of IL-6 secretion was seen in the presence of NF-κB inhibitors, as previously reported (20) (data not shown). These data indicate that while LPS-induced IL-6 production is NF-κB dependent, the mixture of activating agents used in this study is capable of stimulating alternative pathways leading to IL-6 production. No significant effect on IL-4 secretion was seen with any of the agents (data not shown). To test whether the decreases in MHC class II and costimulatory molecule expression correlated with diminished APC function, untreated, DMSO-, and vitamin C and α-TOH-treated DCs were tested for their capacity to support allogeneic T cell proliferation. As expected, iDC were poor at stimulating a mixed lymphocyte response, while stimulated DC supported vigorous proliferation (Fig. 3⇓). 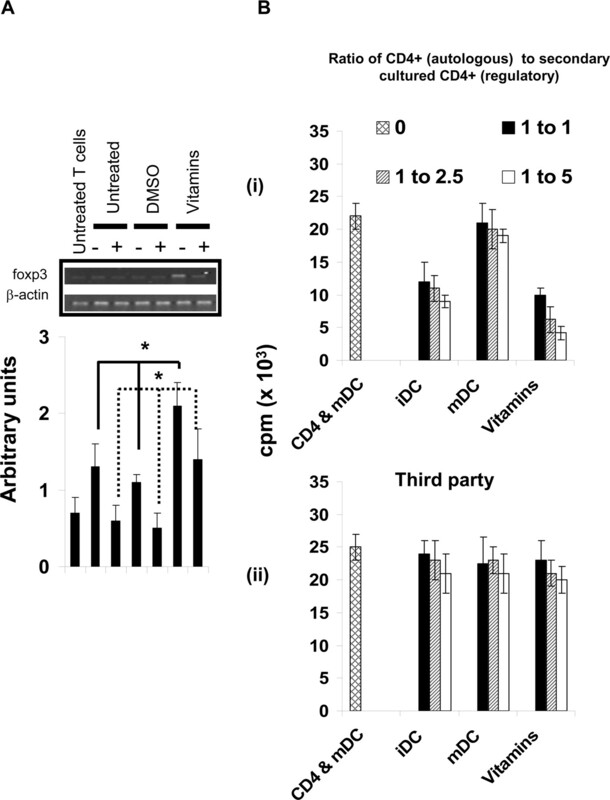 Vitamin C and α-TOH treatment of DC before stimulation reduced the ability of the DCs to induce the proliferation of allogeneic T cells, to the level of iDCs. This inhibition of the mixed lymphocyte response was similar to that seen with DEX- and NF-κB inhibitor-treated DCs (Fig. 3⇓). This effect of vitamin treatment was not only seen when naive T cells were used as responders, but also with CD4+CD45RO, CD4+CD45RA, and CD4+CD25− populations of T cells (data not shown). DCs treated with vitamins have a reduced ability to stimulate allogeneic T cells. Following treatment with vitamin C and α-TOH, DMSO (carrier), DEX, PSI, or SN50N, the DC were either stimulated (+, open symbols) with 20 ng/ml IL-1β, 20 ng/ml TNF-α, 20 ng/ml IL-6, 20 ng/ml LPS, 10 ng/ml PGE2, and 20 ng/ml IFN-γ (for 24 h) or left unstimulated (−, filled symbols). They were then cocultured with allogeneic T cells, and the proliferation was determined by [3H]thymidine incorporation at day 5. The results are shown as the mean (cpm) ± SD. The data showed are the representative of at least three experiments. 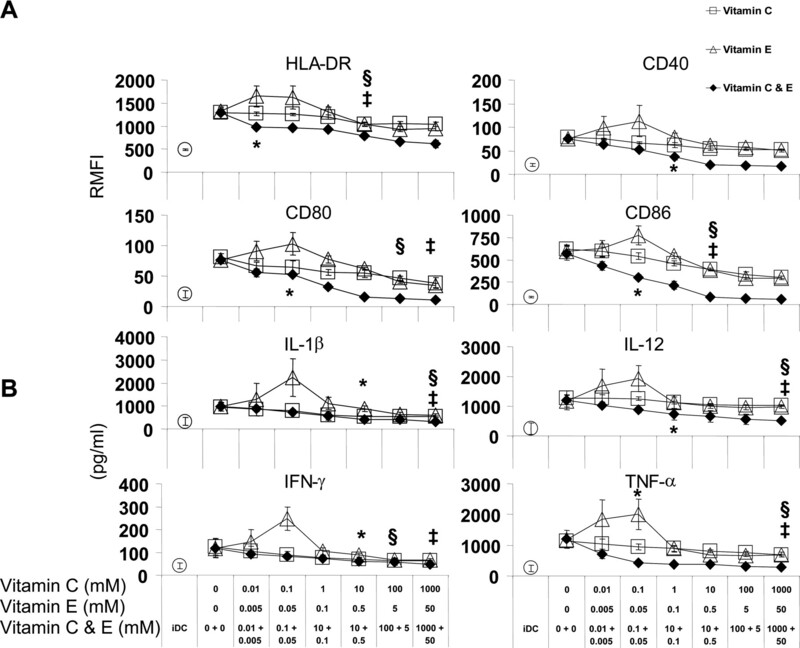 In addition to having a reduced proliferation, allogeneic lymphocytes incubated with vitamin-treated DC showed a Th2 skewed pattern of cytokine secretion, with high IL-10 and Th2 cytokine (IL-4, IL-5 (data not shown), and IL-13 (data not shown)) production on day 4 of culture (Fig. 4⇓). A similar profile was seen with CD4+CD45RA, CD4+CD45RO, and CD4+CD25− cells (data not shown). Vitamin-treated DCs stimulate a Th2-like cytokine profile. A, Supernatants were collected on day 4 from cultures of allogeneic T cells and untreated, vitamin-, DEX-, or SN50-treated DC that had either been unstimulated (−) or stimulated (+) (20 ng/ml IL-1β, 20 ng/ml TNF-α, 20 ng/ml IL-6, 20 ng/ml LPS, 10 ng/ml PGE2 and 20 ng/ml IFN-γ). The levels of IL-4, IL-10, and IFN-γ were determined using ELISA. The results were mean of triplicate wells ± SD. The data shown are the representative of at least three experiments. The susceptibility of DC to apoptosis following treatment with vitamins C and α-TOH was determined by annexin V/PI staining. Cells were assessed with and without stimulation with the mixture of proinflammatory agents (20 ng/ml IL-1β, 20 ng/ml TNF-α, 20 ng/ml IL-6, 20 ng/ml LPS, 10 ng/ml PGE2, and 20 ng/ml IFN-γ). Little apoptosis was seen in vitamin-treated cells both before and after stimulation on day 6 (Fig. 5⇓). This is in contrast to DEX- and SN50-treated cells, which showed little apoptosis before stimulation, but considerable cell death following stimulation. PSI induced a small degree of apoptosis following stimulation. Vitamin treatment is not associated with apoptosis of DC. To determine the effect of vitamin treatment on the survival of cells, DCs were cultured with vitamin C and α-TOH, DEX, PSI, or SN50 on day 2, and the cells were either left unstimulated or stimulated with a mixture of agents (20 ng/ml IL-1β, 20 ng/ml TNF-α, 20 ng/ml IL-6, 20 ng/ml LPS, 10 ng/ml PGE2, and 20 ng/ml IFN-γ) on day 5. The cells were analyzed using Annexin VFITC and PI staining, followed by flow cytometry on day 6. The y-axis represents PI staining, and x-axis represents Annexin VFITC. The data shown are representative of at least three experiments. Little apoptosis was seen in vitamin-treated cells both before and after stimulation on day 6 (second column). This is in contrast to DEX (third column)- and SN50 (fifth column)-treated cells, which showed little apoptosis before stimulation, but considerable cell death following stimulation. PSI induced a small degree of apoptosis following stimulation (fourth column). PSI and SN50 have different modes of action, which may explain the difference seen between these NF-κB inhibitors. PSI blocks proteasome degradation of IκB, whereas SN50 prevents the translocation of NF-κB to the nucleus. The additional inhibitory action of PSI on proteasome activity may account for the difference in apoptosis profiles of PSI and SN50. We went on to analyze the intracellular signaling of cells following treatment with vitamins (Fig. 6⇓). Using an adenovirally encoded promoter reporter system, consisting of four tandem copies of the κ enhancer element located upstream of the firefly luciferase gene, we measured the intracellular activity of NF-κB. DCs treated with vitamins, DEX, and NF-κB inhibitors have low levels of NF-κB activity following stimulation at 4 (data not shown), 12 (data not shown), and 24 h (Fig. 6⇓A). To determine whether this is due to degradation of IκB, we measured the levels of phosphorylated IκB at 4 (data not shown), 12 (data not shown), and 24 h (Fig. 6⇓B). Following stimulation of untreated DC, the levels of phosphorylated IκB increased at all time points. This was also seen in DEX- and NF-κB inhibitor-treated cells. However, in vitamin-treated cells, there was no increase in phosphorylated IκBα following stimulation at all time points. NF-κB, PKR, PKC, and p38 MAPK inhibition in DCs treated with vitamins. DCs were cultured with DMSO, vitamins, DEX, PSI, and SN50 on day 2, and the cells were either left unstimulated (−) or stimulated (+) with 20 ng/ml IL-1β, 20 ng/ml TNF-α, 20 ng/ml IL-6, 20 ng/ml LPS, 10 ng/ml PGE2, and 20 ng/ml IFN-γ. A, The cells were then infected with an adenoviral vector encoding for luciferase under control of a NF-κB-dependent promoter for 48 h. The luciferase activity was determined using a luminometer. The results are expressed as mean (light per unit) ± SD. B, The activity of the NF-κB, PKR, PKC, and p38 MAPK pathways was determined with Western blotting using Abs specific for the following proteins (and their phosphorylated forms): IκBα, PKR, eIF-2α, PKC, and p38 MAPK 12 h after incubation with (+) or without (−) the stimulatory mixture of agents. β-actin was used as a housekeeping control. C, The intercellular level of ROS was determined by measuring the fluorescence intensity after incubating DC with DCF. The data shown are representative of at least three experiments. We further analyzed PKR protein, PKC, and p38 MAPK signaling pathways by Western blotting for phosphorylated forms of the molecules and, in the case of the PKR pathway, for downstream phosphorylation of eIF-2α at 4 (data not shown), 12 (data not shown), and 24 h (Fig. 6⇑B). All three signaling pathways were up-regulated in DCs following stimulation at all time points. The increase in phosphorylated PKC, PKR, and eIF-2α was seen in DC pretreated with DEX and NF-κB inhibitors, but not in vitamin-treated cells at all time points. Phosphorylation of p38 MAPK was inhibited by vitamins and by DEX, but not by the NF-κB inhibitors at all time points. Stimulation of untreated DCs resulted in an increase in the levels of intracellular ROS (Fig. 6⇑C). In contrast, treatment with vitamins resulted in lower level of ROS in both stimulated and unstimulated DC. DEX and NF-κB inhibitor treatment also reduced the level of ROS seen following activation. It should be noted that this reduction in ROS in vitamin-treated DC is not a direct consequence of the antioxidative properties of the vitamins on the ROS, but rather as a result of the inhibition of DC activation by the vitamins resulting in a reduction of the ROS of the cells. Thus, addition of vitamins 24–72 h before stimulation substantially reduces the ROS, while addition 6 h before stimulation results in only a minor reduction in ROS. To determine whether T cells exposed to vitamin-treated mDCs had become anergic, we performed two-step cultures. Naive T cells were cocultured with stimulated mDCs (unmodified, DMSO, or vitamin treated) for 5 days and rested for 5 days. These were then rechallenged with either mDCs from the same donor, or third party mDCs. Proliferation was assessed on days 3, 5, and 7 to differentiate between T cell populations that had not responded to Ag previously (equivalent to the primary immune response) and those that had encountered and been activated by Ag (equivalent to the secondary response). T cells previously exposed to vitamin-treated DC failed to respond to mDCs from the same donor, although they did respond to third party DCs with kinetics typical of a first-time encounter with Ags (peak at day 5) (Fig. 7⇓A). T cells stimulated with control DCs in the first culture showed a subsequent rapid response to DCs from the same donor, typical of response that had seen the Ags previously (peak at day 3). The anergized T cells had high levels of p27kip1 (Fig. 7⇓B), and the majority of T cells were arrested at the early G1 phase of the cell cycle (data not shown), consistent with their anergic phenotype (43). The cells also expressed FoxP3 (as determined by RT-PCR; Fig. 8⇓A). Similarly, when CD4+CD25− cells were used, a specific up-regulation of FoxP3 mRNA was seen in these cells (data not shown). As expected, the hyporesponsiveness of the T cells could be reversed by addition of exogenous rIL-2. When the iDCs (either unmodified or treated with DMSO or vitamin) were used, a response similar to vitamin-treated and stimulated mDC was observed (data not shown). Similar data were seen when CD4+CD45RO or CD4+CD25− T cells were incubated with vitamin-treated DCs that had been stimulated (data not shown). The ability to generate anergic T cells from the CD4+CD25− subpopulation indicated that the hyporesponsiveness is unlikely to be due to preferential expansion or activation of pre-existing CD25+ regulatory cells. Vitamin-treated DCs induce anergic T cells. A, Purified T cells (106) were cocultured with DCs (10:1 ratio), which were either unmodified or treated with vitamins or DMSO before stimulation. After 5 days, T cells were removed and rested in culture for an additional 5 days. The cells were then put into fresh culture with stimulated, untreated DCs (5:1 ratio) from either the same donor (i and iii) or third party donor (ii and iv) in the presence (iii and iv) or absence (i and ii) of 10 U/ml exogenous rIL-2. The proliferation of T cells was determined by [3H]thymidine incorporation on days 3, 5, and 7. The results are expressed as the mean ± SD of triplicate wells. B, T cells exposed to unmodified DCs, DMSO-treated DCs, or vitamin-treated DCs were analyzed for expression of p27kip1 and β-actin expression by Western blotting. The density of the p27kip1 bands (as a ratio to the β-actin levels) is shown below, as the mean ± SD of third experiments. Vitamin-treated DCs regulate allogeneic MLR in donor-specific manner and induce expression of FoxP3 on T cells. A, Following exposure to unmodified iDCs (−) or mDC (activated with 20 ng/ml IL-1β, 20 ng/ml TNF-α, 20 ng/ml IL-6, 20 ng/ml LPS, 10 ng/ml PGE2, and 20 ng/ml IFN-γ) (+) or vitamin-treated iDCs (−) or mDC (+), the CD4+ T cells were isolated. The level expression of FoxP3 was determined using RT-PCR. The density of the FoxP3 bands (as a ratio to the β-actin levels) is expressed as the mean ± SD of three experiments. ∗, p < 0.05 when ANOVA analysis was conducted to compare vitamin-treated DC with DMSO-treated DC or unmodified DC (± stimulation). B, The indicated number of irradiated T cells generated following incubation with unmodified (either unstimulated (iDC) or stimulated (mDC)) or with vitamin-treated and stimulated DCs was added to an MLR between fresh T cells (from the same donor) and DCs from either the original donor (i) or third party donor (ii). [3H]Thymidine incorporation was measured on day 5. All data are representative of three experiments. To determine whether the anergized allospecific T cells generated by incubation with vitamin-treated DC were capable of regulation, they were added back into fresh MLRs using untreated stimulated DC and T cells. As seen (Fig. 8⇑B), when increasing numbers of T cells that had been incubated with either iDC- or vitamin-treated and stimulated DC were added to the MLR, the proliferation capacity of the fresh T cells was diminished. However, this regulation was not seen with third party stimulator DC. The degree of inhibition is similar to that seen in published data showing allospecific regulation of MLR by anergic or regulatory T cells (15, 44, 45). The need for a relatively high number of regulatory cells to be effective presumably reflects the low frequency of allospecific cells engaged by the DC. These data indicate that allospecific T cells derived from the primary cultures with vitamin-treated DCs or iDCs were not only anergic, but were also able to regulate other T cells in an Ag-specific manner. In a similar manner to the anergic cells, regulatory cells can be generated from CD45RA, CD45RO, and CD25− cells (data not shown). To determine how the anergic T cells regulate the proliferative response of other T cells, we used a selection of neutralizing Abs. Neutralization of IL-4, IL-10, or TGF-β1 had no effect on the inhibition of proliferation (Fig. 9⇓A). We then determined whether cell contact was needed to mediate the regulatory effect. T cells recovered from the primary cultures of untreated, stimulated DC showed no obvious regulatory capacity when cocultured in a secondary culture of T cells and the donor DCs. T cells recovered from vitamin-treated, stimulated, DC culture regulated the subsequent cultures. When these cells were separated from the secondary culture in a transwell system, no regulatory effect was seen (Fig. 9⇓B). This indicates that the regulation involves a cell-cell contact-dependent mechanism. Vitamin C- and α-TOH-induced regulatory T cells act through contact-dependent manner, but not through cytokines. T cells from following culture with iDC, mDC (activated with 20 ng/ml IL-1β, 20 ng/ml TNF-α, 20 ng/ml IL-6, 20 ng/ml LPS, 10 ng/ml PGE2, and 20 ng/ml IFN-γ), or vitamin-treated mDC were purified. A, The cells (following irradiation) were then added into secondary culture with activated DCs either from the same donor or a third party donor and allogeneic T cells in the presence of 10 μg/ml neutralizing Abs to IL-4, IL-10, and TGF-β. B, The T cells following the primary culture with untreated or vitamin-treated (and then stimulated) DC were either added into the same well as a secondary culture with DC from the original donor and allogeneic T cells, or were separated from the culture using a transwell system. CD4 & mDC, Indicate secondary cultures that did not receive any cells from the primary culture. The [3H]thymidine incorporation was measured on day 5. The results are mean (cpm) ± SD. The data shown are the representative of at least three experiments. C, MLR were set up using DC that had been incubated with nothing, DMSO, or vitamins, and then either stimulated (+) or not (−). The T cells were then separated from each other on day 5, and analyzed for expression of PD-L1 and β-actin by Western blotting. The density of the PD-L1 bands (as a ratio to the β-actin levels) is shown below, as the mean ± SD of three experiments. ∗, p < 0.05 when ANOVA analysis was conducted to compare vitamin-treated DC with DMSO-treated DC or unmodified DC (± stimulation). As in other in vitro systems previously described, the molecular mechanisms of suppression remain elusive (46). Although our regulatory T cells (following exposure to vitamin-treated DCs) produced high levels of Th2 cytokines, we could not demonstrate a direct role of inhibitory cytokines such as IL-4, IL-10, TGF-β (Fig. 9⇑A), IL-5 (data not shown), and IL-13 (data not shown). Because the allogeneic T cells exposed to vitamin-treated DCs produced a different cytokine profile (Th2 biased) from the allogeneic T cells coculturing with iDC, we went to analyze their differential expression of PD-L1 by treated DC and by the allogeneic T cells following the exposure to the treated DCs. This apparent Th2 bias may be due to the PD-1-PD-L1 interaction (between DC-T cells and T-T cells), as has been previously described (47). As can be seen in Fig. 9⇑C, vitamin-treated DCs and T cells exposed to vitamin-treated DCs had a higher expression of PD-L1 than their untreated counterparts (unstimulated or stimulated). The regulatory properties of vitamin treatment may be mediated through the up-regulation of PD-L1. In this study, we demonstrate that vitamins C and E profoundly affect human monocyte-derived DCs, not only by preventing the up-regulation of costimulatory molecules and MHC class II molecules upon stimulation, but also by reducing the secretion of Th1 cytokines such as IL-12 and IFN-γ. As expected from previous data, we also found that DEX blocked up-regulation of CD80, CD86, and MHC class II (18, 48). In addition, we also demonstrated that up-regulation of CD40 was inhibited. We verified that blockade of NF-κB pathway using either a PSI (49) or an inhibitor of NF-κB translocation (SN50) (26) resulted in the inhibition of DC activation. In DC treated with vitamin C and α-TOH, no significant increase of apoptosis was seen, either before or after receiving an activation stimulus. This is consistent with data showing that α-TOH, which is used in this study, lacks apoptogenic activity (50). This is in contrast to what we saw with DEX- or SN50-treated DCs, in which a large proportion of the cells underwent apoptosis following stimulation. PSI and SN50 have different modes of action, which may explain the difference seen between these NF-κB inhibitors. PSI acts through prevention of IκB phosphorylation by inhibition of proteasome activity, whereas SN50 prevents the translocation of NF-κB to the nucleus. The additional inhibitory action of PSI on proteasome activity may account for the difference in apoptosis profiles of PSI and SN50. Consistent with these phenotypic and functional changes, DCs treated with vitamins were less able to stimulate allogeneic T cells than untreated DCs. It is important to note that the use of vitamin C alone or α-TOH alone did not result in generation of anergic T cells (data not shown). Vitamin-treated DC can block the response not only of naive T cells, but also of CD4+CD45RO and CD4+CD25− T cells. Cytokine production from the regulated MLR cultures is skewed toward a Th2 profile. The T cells from the culture exposed to vitamin-treated DCs were anergic and can regulate the response of other T cells in an alloantigen-specific manner. This regulation is contact dependent, but IL-4, IL-5, IL-10, IL-13, and TGF-β independent. These data suggest that administration of vitamin-treated DC may be useful in tolerance induction as such regulation will allow linked suppression of the response to different Ags displayed by the same DC. As discussed above, there are several agents that can prevent activation of DC, resulting in a tolerogenic phenotype (18, 19, 20, 21, 22). These include vitamin D. The biologically active form of this vitamin, 1α,25-dihydroxyvitamin D3 (1,25(OH)2D3) (or its analogues), can block both monocyte differentiation into DC and the activation of DC (51, 52, 53, 54, 55) at least in part by inhibition of the NF-κB pathway (56, 57). T cells exposed to 1,25(OH)2D3-treated DC are unresponsive (58, 59), may undergo apoptosis (58, 59, 60), can be anergic to subsequent stimulation with Ag (51, 59, 61), and can adopt a regulatory phenotype (59, 61). Unlike vitamins C and E, 1,25(OH)2D3 is a steroid, and its operation is through a specific receptor, as shown by its lack of action in (murine) DC lacking vitamin D receptors (51, 52). There are several signaling pathways that contribute to DC activation. The most central pathway is mediated by NF-κB; as previously reported (20) and confirmed in this publication, inhibition of this pathway on its own blocks DC activation, as determined by up-regulation of costimulatory molecules and the ability to stimulate T cell proliferation. We have shown that in vitamin-treated DC there was a failure to up-regulate NF-κB trans activation activity on stimulation. The generation of ROS can contribute to NF-κB activation by PKR, PKC, and p38 MAPK pathways. DC treated with vitamins, DEX, or NF-κB inhibitors showed reduction in the up-regulation of ROS upon stimulation. However, activated DC show higher ROS than unactivated DC, indicating that generation of ROS is a consequence, as well as a cause, of DC activation (23). Although their role as antioxidants is important, α-TOH in particular can influence cellular activation through its influence on other components of the signaling cascade. For example, inhibition of PKC activity by α-TOH has been reported in smooth muscle (62), monocytes (31), macrophages (63), neutrophils (64), fibroblasts (65), and mesangial cells (66), but has not been previously described for DCs. Inhibition occurs either by prevention of the autophosphorylation of PKC, which is necessary for activity, or by dephosphorylation of PKC by protein phosphatase type 2A, which is activated by α-TOH (67). There is growing evidence to implicate PKC isoforms in the regulation of immune functions such as inhibition of B cell signaling (68), inhibition of NF-κB activation in T cells (69), inhibition of NO production or MAPK-phosphatase-1 induction in macrophages (70), and inhibition of IL-12 production by DC through NF-κB activation (71). In various cell lines (such as HeLa, monocytic U937, myeloid leukemia HL-60, and breast MCF7) and primary endothelial cells, the treatment with vitamin C results in PKC inhibition (72). This causes the impairment of proinflammatory stimuli-induced IκBα degradation and consequent NF-κB activation (72). This is consistent with our observations that in vitamin C- and α-TOH-treated DCs, the level of phosphorylated PKC is low and there is a failure to activate NF-κB upon stimulation. Vitamin E is known to inhibit the p38 MAPK pathway in smooth muscle cells (73). Treatment with vitamin C alone enhanced the expression of phosphorylated p38 MAPK in murine melanoma cells due to an increase in intracellular region of interest levels (33). It has been reported that low concentrations of quinone activated p38, while high concentrations inhibited p38 activity (74). In this study, we showed that at optimal concentration of vitamin C and α-TOH, the activity of p38 MAPK pathway could be inhibited in human DCs. The effect of vitamin E was complex. There was bimodal effect; at lower concentrations, DC demonstrated enhanced maturation. This phenomenon was due to activation of p38 MAPK activity secondary to a rebound increase in the region of interest level (data not shown). This observation would have significance in clinical settings, because it suggests that vitamin E at low doses is paradoxically proinflammatory. This may partially account for the highly variable effects of vitamin E documented in clinical trials (5, 75, 76). PKR protein is an established component of innate antiviral immunity. Recently, PKR has been shown to be a signal transduction in other situations of cellular stress. The relationship between PKR and the stress-activated protein kinases, such as p38 MAPK, has been demonstrated in fibroblast cells (77). A virus-independent activator of PKR, a cellular protein called PKR-activating protein, has been described, which can be influenced by p38 MAPK through ROS levels (78). PKR is a component of the IκB kinase complex and plays either a catalytic or structural role in the activation of IκB kinase (79). Vitamin E has been shown to prevent activation of NADPH oxidase in monocytes by prevention of p47phox membrane translocation and phosphorylation (80). Low activity of NADPH oxidase in mitochondria leads to lower level of intracellular ROS. We have observed inhibition of PKR and its downstream molecules such as eIF-2α in DC treated with vitamin C and α-TOH. This inhibition may result in the blockade of NF-κB activation, as the interlink between PKR and NF-κB activation has also been reported in endothelial cells (32). With DEX there was a decrease in ROS and p38 MAPK activity similar to that seen in response to vitamin C and α-TOH treatment. However, there was little or no inhibition of IκBα phosphorylation, but a strong inhibition of NF-κB activity, consistent with the action of DEX. DEX inhibits NF-κB activity through two pathways: induction of IκBα synthesis (81) and a direct interference with NF-κB-dependent trans activation (82). These differences in the signaling pathways affected by treatment may explain why, although the effects of DEX and vitamin treatment are broadly similar, there are differences, for example, in the profile of cytokines secreted and their susceptibility to apoptosis. It should also be noted that the vitamins may be operating by mechanisms that are not dependent on signaling pathways. Thus, thiol antioxidants (such as N-acetyl-cysteine) have been shown to directly interfere with IL-12 heterodimer formation, suggesting that other antioxidants may also block IL-12 activity (24). In this work, we have demonstrated several ways of inhibiting DC maturation. The central inhibition of NF-κB pathway by all reagents used in this study resulted in a maturational arrest. In addition, vitamin C and E not only inhibit the NF-κB pathway, but also intracellular ROS, PKR, eIF-2α, PKC, and p38 MAPK pathways. 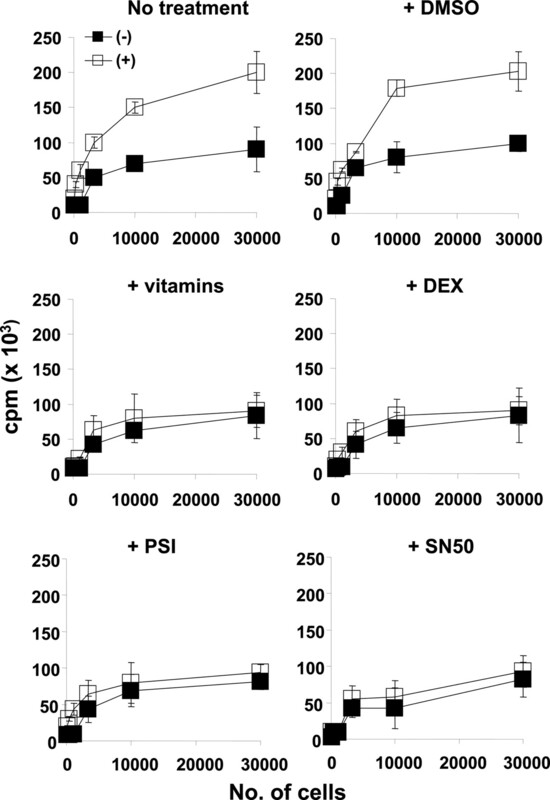 Vitamin treatment results in lower apoptosis following proinflammatory stimulation than DEX and SN50 treatment, suggesting that it would be possible to use less cells in tolerance induction protocols. The role of vitamins C and Ε is of interest not only in understanding the biology of DC activation, but also because of their therapeutic possibilities. For example, daily supplementation of 400 IU of vitamin E orally twice daily and 500 mg of vitamin C orally twice daily can achieve serum level of 103 and 65 μM, respectively (10). This opens up the possibility of using vitamin-treated DC for the induction of tolerance to auto- or alloantigens. Indeed, a recent clinical trial has shown that the use of vitamin C and E resulted in a delay of chronic rejection of allogeneic heart transplant (10). Our results suggest that a possible mechanism to explain the outcome of this trial is the effect of vitamins on DCs. We thank Charlotte Jago for her help in optimizing some of the cellular assays performed in this study, and Dr. P. McCray, Jr., for providing NF-κB luciferase reporter adenovirus. ↵1 This work was supported by grants from the Medical Research Council, Biotechnology and Biological Sciences Research Council, and Arthritis Research Council. P.H.T. is a Medical Research Council/Royal College of Surgeons Edinburgh Training Fellow. A.J.T.G. is a Biotechnology and Biological Sciences Research Council Research Development Fellow. ↵2 Current address: Department of Nephrology and Transplantation, Division of Immunology, Infection and Inflammatory Diseases, Guy’s King’s and St. Thomas’ School of Medicine, King College London, Guy’s Hospital, London SE1 9RT, U.K.
↵3 Current address: Department of Biostatistics and Bioinformatics, Centre for Bioinformatics and Computational Biology, Research Drive, Duke University, Durham, NC 27708. ↵4 Current address: Department of Disease Biology, Rheumatology and Inflammation, Respiratory and Inflammatory Diseases, Center of Excellence for Drug Discovery, GlaxoSmithKline Medicines Research Centre, Gunnels Wood Road, Stevenage, Herts SG1 2NY, U.K.
↵5 Current address: University Eye Hospital, University of Heidelberg, INF 400, D69120 Heidelberg, Germany. ↵7 Abbreviations used in this paper: α-TOH, α-tocopherol; 1,25(OH)2D3, 1α,25-dihydroxyvitamin D3; DC, dendritic cell; DCF, 2′7′-dichlorofluorescin; DEX, dexamethasone; eIF-2α, eukaryotic translation initiation factor 2α; iDC, immature DC; mDC, mature DC; PD-L1, programmed cell death ligand 1; PI, propidium iodide; PKC, protein kinase C; PKR, protein kinase RNA regulated; PSI, proteasome inhibitor; ROS, reactive oxygen species. Evans, H. M., K. S. Bishop. 1922. On the existence of hitherto unrecognized dietary factor essential for reproduction. Nature 56: 650-651. Ouahchi, K., M. Arita, H. Kayden, F. Hentati, M. Ben Hamida, R. Sokol, H. Arai, K. Inoue, J. L. Mandel, M. Koenig. 1995. Ataxia with isolated vitamin E deficiency is caused by mutations in the α-tocopherol transfer protein. Nat. Genet. 9: 141-145. Gotoda, T., M. Arita, H. Arai, K. Inoue, T. Yokota, Y. Fukuo, Y. Yazaki, N. Yamada. 1995. Adult-onset spinocerebellar dysfunction caused by a mutation in the gene for the α-tocopherol-transfer protein. N. Engl. J. Med. 333: 1313-1318. Gruppo Italiano per lo Studio della Sopravvivenza nell’Infarto miocardico. 1999. Dietary supplementation with n-3 polyunsaturated fatty acids and vitamin E after myocardial infarction: results of the GISSI-Prevenzione trial. Lancet 354: 447-455. Yusuf, S., G. Dagenais, J. Pogue, J. Bosch, P. Sleight. 2000. Vitamin E supplementation and cardiovascular events in high-risk patients: The Heart Outcomes Prevention Evaluation Study Investigators. N. Engl. J. Med. 342: 154-160. Constantinescu, A., D. Han, L. Packer. 1993. Vitamin E recycling in human erythrocyte membranes. J. Biol. Chem. 268: 10906-10913. Cederberg, J., C. M. Siman, U. J. Eriksson. 2001. Combined treatment with vitamin E and vitamin C decreases oxidative stress and improves fetal outcome in experimental diabetic pregnancy. Pediatr. Res. 49: 755-762. Jha, P., M. Flather, E. Lonn, M. Farkouh, S. Yusuf. 1995. The antioxidant vitamins and cardiovascular disease: a critical review of epidemiologic and clinical trial data. Ann. Intern. Med. 123: 860-872. Martin, A., K. Youdim, A. Szprengiel, B. Shukitt-Hale, J. Joseph. 2002. Roles of vitamins E and C on neurodegenerative diseases and cognitive performance. Nutr. Rev. 60: 308-326. Fang, J. C., S. Kinlay, J. Beltrame, H. Hikiti, M. Wainstein, D. Behrendt, J. Suh, B. Frei, G. H. Mudge, A. P. Selwyn, P. Ganz. 2002. Effect of vitamins C and E on progression of transplant-associated arteriosclerosis: a randomized trial. Lancet 359: 1108-1113. Guermonprez, P., J. Valladeau, L. Zitvogel, C. Thery, S. Amigorena. 2002. Antigen presentation and T cell stimulation by dendritic cells. Annu. Rev. Immunol. 20: 621-667. Lechler, R., W. F. Ng, R. M. Steinman. 2001. Dendritic cells in transplantation: friend or foe?. Immunity 14: 357-368. Frasca, L., P. Carmichael, R. Lechler, G. Lombardi. 1997. Anergic T cells affect linked suppression. Eur. J. Immunol. 27: 3191-3197. Jonuleit, H., E. Schmitt, G. Schuler, J. Knop, A. H. Enk. 2000. 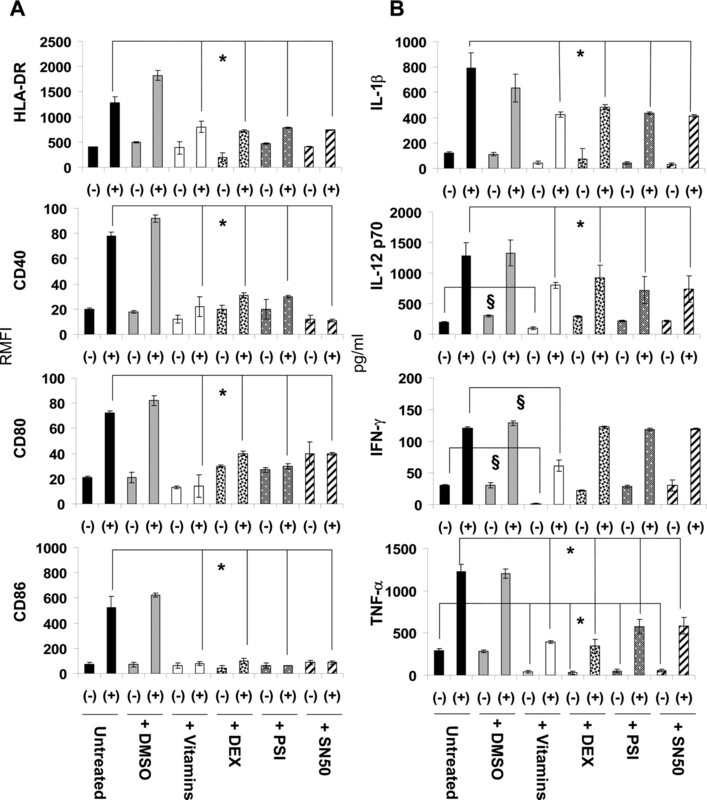 Induction of interleukin 10-producing, nonproliferating CD4+ T cells with regulatory properties by repetitive stimulation with allogeneic immature human dendritic cells. J. Exp. Med. 192: 1213-1222. Lu, L., A. W. Thomson. 2002. Manipulation of dendritic cells for tolerance induction in transplantation and autoimmune disease. Transplantation 73: S19-S22. Morelli, A. E., H. Hackstein, A. W. Thomson. 2001. Potential of tolerogenic dendritic cells for transplantation. Semin. Immunol. 13: 323-335. Kitajima, T., K. Ariizumi, P. R. Bergstresser, A. Takashima. 1996. A novel mechanism of glucocorticoid-induced immune suppression: the inhibiton of T cell-mediated terminal maturation of a murine dendritic cell line. J. Clin. Invest. 98: 142-147. Penna, G., L. Adorini. 2000. 1α,25-Dihydroxyvitamin D3 inhibits differentiation, maturation, activation, and survival of dendritic cells leading to impaired alloreactive T cell activation. J. Immunol. 164: 2405-2411. Yoshimura, S., J. Bondeson, F. M. Brennan, B. M. Foxwell, M. Feldmann. 2001. Role of NFκB in antigen presentation and development of regulatory T cells elucidated by treatment of dendritic cells with the proteasome inhibitor PSI. Eur. J. Immunol. 31: 1883-1893. Steinbrink, K., M. Wolfl, H. Jonuleit, J. Knop, A. H. Enk. 1997. Induction of tolerance by IL-10-treated dendritic cells. J. Immunol. 159: 4772-4780. Lu, L., W. C. Lee, T. Takayama, S. Qian, A. Gambotto, P. D. Robbins, A. W. Thomson. 1999. Genetic engineering of dendritic cells to express immunosuppressive molecules (viral IL-10, TGF-β, and CTLA4Ig). J. Leukocyte Biol. 66: 293-296. Rutault, K., C. Alderman, B. M. Chain, D. R. Katz. 1999. Reactive oxygen species activate human peripheral blood dendritic cells. Free Radical Biol. Med. 26: 232-238. Mazzeo, D., S. Sacco, P. Di Lucia, G. Penna, L. Adorini, P. Panina-Bordignon, P. Ghezzi. 2002. Thiol antioxidants inhibit the formation of the interleukin-12 heterodimer: a novel mechanism for the inhibition of IL-12 production. Cytokine 17: 285-293. Islam, K. N., S. Devaraj, I. Jialal. 1998. α-Tocopherol enrichment of monocytes decreases agonist-induced adhesion to human endothelial cells. Circulation 98: 2255-2261. Mitsiades, N., C. S. Mitsiades, V. Poulaki, D. Chauhan, P. G. Richardson, T. Hideshima, N. Munshi, S. P. Treon, K. C. Anderson. 2002. Biologic sequelae of nuclear factor-κB blockade in multiple myeloma: therapeutic applications. Blood 99: 4079-4086. Zhou, L. J., T. F. Tedder. 1996. CD14+ blood monocytes can differentiate into functionally mature CD83+ dendritic cells. Proc. Natl. Acad. Sci. USA 93: 2588-2592. Tan, P. H., C. Chan, S. A. Xue, D. Dong, B. Ananthesayanan, M. Manunta, C. Kerouedan, C. Cheshire, J. Wolfe, D. O. Haskard, et al 2004. Phenotypic and functional differences between human saphenous vein (HSVEC) and umbilical vein (HUVEC) endothelial cells. Atherosclerosis 173: 171-183. Tan, P. H., S. C. Beutelspacher, S. A. Xue, Y. H. Wang, P. Mitchell, J. C. McAlister, D. F. Larkin, M. O. McClure, H. J. Stauss, M. A. Ritter, et al. 2005. Modulation of human dendritic cell function following transduction with viral vectors; implications for gene therapy. Blood. In press..
Verhasselt, V., O. Vosters, C. Beuneu, C. Nicaise, P. Stordeur, M. Goldman. 2004. Induction of FOXP3-expressing regulatory CD4pos T cells by human mature autologous dendritic cells. Eur. J. Immunol. 34: 762-772. Devaraj, S., D. Li, I. Jialal. 1996. The effects of α tocopherol supplementation on monocyte function: decreased lipid oxidation, interleukin 1β secretion, and monocyte adhesion to endothelium. J. Clin. Invest. 98: 756-763. Harcourt, J. L., M. K. Hagan, M. K. Offermann. 2000. Modulation of double-stranded RNA-mediated gene induction by interferon in human umbilical vein endothelial cells. J. Interferon Cytokine Res. 20: 1007-1113. Cho, D., E. Hahm, J. S. Kang, Y. I. Kim, Y. Yang, J. H. Park, D. Kim, S. Kim, Y. S. Kim, D. Hur, et al 2003. Vitamin C down-regulates interleukin-18 production by increasing reactive oxygen intermediate and mitogen-activated protein kinase signalling in B16F10 murine melanoma cells. Melonoma Res. 13: 549-554. Tan, P. H., S. Beutelspacher, Y. H. Wang, M. A. Ritter, M. O. McClure, G. Lombardi, A. J. George. 2005. Immunolipoplexes: an efficient, non-viral alternative for transfection of human dendritic cells with potential for clinical vaccination. Mol. Ther. 11: 790-800. Hempel, S. L., G. R. Buettner, Y. Q. O’Malley, D. A. Wessels, D. M. Flaherty. 1999. Dihydrofluorescein diacetate is superior for detecting intracellular oxidants: comparison with 2′,7′-dichlorodihydrofluorescein diacetate, 5(and 6)-carboxy-2′,7′-dichlorodihydrofluorescein diacetate, and dihydrorhodamine 123. Free Radical Biol. Med. 27: 146-159. Sanlioglu, S., C. M. Williams, L. Samavati, N. S. Butler, G. Wang, P. B. McCray, Jr, T. C. Ritchie, G. W. Hunninghake, E. Zandi, J. F. Engelhardt. 2001. Lipopolysaccharide induces Rac1-dependent reactive oxygen species formation and coordinates tumor necrosis factor-α secretion through IKK regulation of NF-κB. J. Biol. Chem. 276: 30188-30198. Tan, P. H., M. Manunta, N. Ardjomand, S. A. Xue, D. F. P. Larkin, D. O. Haskard, K. M. Taylor, A. J. T. George. 2003. Antibody targeted gene transfer to endothelium. J. Gene Med. 5: 311-323. Jiang, S., N. Camara, G. Lombardi, R. I. Lechler. 2003. Induction of allopeptide-specific human CD4+CD25+ regulatory T cells ex vivo. Blood 102: 2180-2186. Vieira, P. L., P. Kalinski, E. A. Wierenga, M. L. Kapsenberg, E. C. de Jong. 1998. Glucocorticoids inhibit bioactive IL-12p70 production by in vitro-generated human dendritic cells without affecting their T cell stimulatory potential. J. Immunol. 161: 5245-5251. Rea, D., C. van Kooten, K. E. van Meijgaarden, T. H. Ottenhoff, C. J. Melief, R. Offringa. 2000. Glucocorticoids transform CD40-triggering of dendritic cells into an alternative activation pathway resulting in antigen-presenting cells that secrete IL-10. Blood 95: 3162-3167. Devaraj, S., I. Jialal. 2000. α Tocopherol supplementation decreases serum C-reactive protein and monocyte interleukin-6 levels in normal volunteers and type 2 diabetic patients. Free Radical Biol. Med. 29: 790-792. Devaraj, S., I. Jialal. 1999. α-Tocopherol decreases interleukin-1β release from activated human monocytes by inhibition of 5-lipoxygenase. Arterioscler. Thromb. Vasc. Biol. 19: 1125-1133. Boussiotis, V. A., G. J. Freeman, P. A. Taylor, A. Berezovskaya, I. Grass, B. R. Blazar, L. M. Nadler. 2000. p27kip1 functions as an anergy factor inhibiting interleukin 2 transcription and clonal expansion of alloreactive human and mouse helper T lymphocytes. Nat. Med. 6: 290-297. Levings, M. K., S. Gregori, E. Tresoldi, S. Cazzaniga, C. Bonini, M. G. Roncarolo. 2004. Differentiation of Tr1 cells by immature dendritic cells requires IL-10 but not CD25+CD4+ Treg cells. Blood 105: 1162-1169. Mahnke, K., Y. Qian, J. Knop, A. H. Enk. 2003. Induction of CD4+/CD25+ regulatory T cells by targeting of antigens to immature dendritic cells. Blood 101: 4862-4869. Bach, J. F., J. Francois Bach. 2003. Regulatory T cells under scrutiny. Nat. Rev. Immunol. 3: 189-198. Selenko-Gebauer, N., O. Majdic, A. Szekeres, G. Hofler, E. Guthann, U. Korthauer, G. Zlabinger, P. Steinberger, W. F. Pickl, H. Stockinger, et al 2003. B7–H1 (programmed death-1 ligand) on dendritic cells is involved in the induction and maintenance of T cell anergy. J. Immunol. 170: 3637-3644. Moser, M., T. De Smedt, T. Sornasse, F. Tielemans, A. A. Chentoufi, E. Muraille, M. Van Mechelen, J. Urbain, O. Leo. 1995. Glucocorticoids down-regulate dendritic cell function in vitro and in vivo. Eur. J. Immunol. 25: 2818-2824. Yoshimura, S., J. Bondeson, B. M. Foxwell, F. M. Brennan, M. Feldmann. 2001. Effective antigen presentation by dendritic cells is NF-κB dependent: coordinate regulation of MHC, co-stimulatory molecules and cytokines. Int. Immunol. 13: 675-683. Neuzil, J., T. Weber, A. Schroder, M. Lu, G. Ostermann, N. Gellert, G. C. Mayne, B. Olejnicka, A. Negre-Salvayre, M. Sticha, et al 2001. Induction of cancer cell apoptosis by α-tocopheryl succinate: molecular pathways and structural requirements. FASEB J. 15: 403-415. Griffin, M. D., W. Lutz, V. A. Phan, L. A. Bachman, D. J. McKean, R. Kumar. 2001. 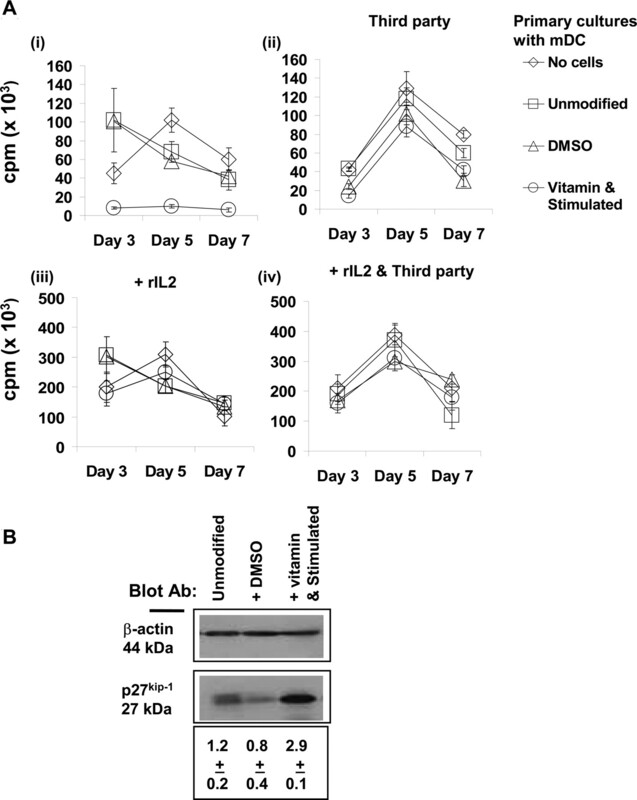 Dendritic cell modulation by 1α,25 dihydroxyvitamin D3 and its analogs: a vitamin D receptor-dependent pathway that promotes a persistent state of immaturity in vitro and in vivo. Proc. Natl. Acad. Sci. USA 98: 6800-6805. Griffin, M. D., W. H. Lutz, V. A. Phan, L. A. Bachman, D. J. McKean, R. Kumar. 2000. 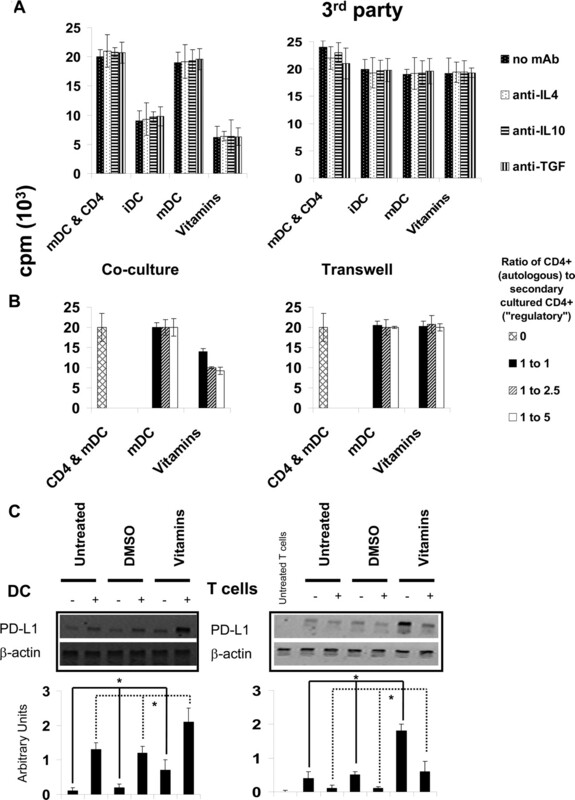 Potent inhibition of dendritic cell differentiation and maturation by vitamin D analogs. Biochem. Biophys. Res. Commun. 270: 701-708. Gauzzi, M. C., C. Purificato, K. Donato, Y. Jin, L. Wang, K. C. Daniel, A. A. Maghazachi, F. Belardelli, L. Adorini, S. Gessani. 2005. Suppressive effect of 1α,25-dihydroxyvitamin D3 on type I IFN-mediated monocyte differentiation into dendritic cells: impairment of functional activities and chemotaxis. J. Immunol. 174: 270-276. Lyakh, L. A., M. Sanford, S. Chekol, H. A. Young, A. B. Roberts. 2005. TGF-β and vitamin D3 utilize distinct pathways to suppress IL-12 production and modulate rapid differentiation of human monocytes into CD83+ dendritic cells. J. Immunol. 174: 2061-2070. Piemonti, L., P. Monti, M. Sironi, P. Fraticelli, B. E. Leone, E. Dal Cin, P. Allavena, V. Di Carlo. 2000. Vitamin D3 affects differentiation, maturation, and function of human monocyte-derived dendritic cells. J. Immunol. 164: 4443-4451. Dong, X., T. Craig, N. Xing, L. A. Bachman, C. V. Paya, F. Weih, D. J. McKean, R. Kumar, M. D. Griffin. 2003. Direct transcriptional regulation of RelB by 1α,25-dihydroxyvitamin D3 and its analogs: physiologic and therapeutic implications for dendritic cell function. J. Biol. Chem. 278: 49378-49385. D’Ambrosio, D., M. Cippitelli, M. G. Cocciolo, D. Mazzeo, P. Di Lucia, R. Lang, F. Sinigaglia, P. Panina-Bordignon. 1998. Inhibition of IL-12 production by 1,25-dihydroxyvitamin D3: involvement of NF-κB down-regulation in transcriptional repression of the p40 gene. J. Clin. Invest. 101: 252-262. Pedersen, A. E., M. Gad, M. R. Walter, M. H. Claesson. 2004. Induction of regulatory dendritic cells by dexamethasone and 1α,25-dihydroxyvitamin D(3). Immunol. Lett. 91: 63-69. Adorini, L., N. Giarratana, G. Penna. 2004. Pharmacological induction of tolerogenic dendritic cells and regulatory T cells. Semin. Immunol. 16: 127-134. Van Halteren, A. G., O. M. Tysma, E. van Etten, C. Mathieu, B. O. Roep. 2004. 1α,25-Dihydroxyvitamin D3 or analogue treated dendritic cells modulate human autoreactive T cells via the selective induction of apoptosis. J. Autoimmun. 23: 233-239. Dong, X., L. A. Bachman, R. Kumar, M. D. Griffin. 2003. Generation of antigen-specific, interleukin-10-producing T-cells using dendritic cell stimulation and steroid hormone conditioning. Transplant Immunol. 11: 323-333. Tasinato, A., D. Boscoboinik, G. M. Bartoli, P. Maroni, A. Azzi. 1995. D-α-tocopherol inhibition of vascular smooth muscle cell proliferation occurs at physiological concentrations, correlates with protein kinase C inhibition, and is independent of its antioxidant properties. Proc. Natl. Acad. Sci. USA 92: 12190-12194. Freedman, J. E., J. H. Farhat, J. Loscalzo, J. F. Keaney, Jr. 1996. α-Tocopherol inhibits aggregation of human platelets by a protein kinase C-dependent mechanism. Circulation 94: 2434-2440. Kanno, T., T. Utsumi, H. Kobuchi, Y. Takehara, J. Akiyama, T. Yoshioka, A. A. Horton, K. Utsumi. 1995. Inhibition of stimulus-specific neutrophil superoxide generation by α-tocopherol. Free Radical Res. 22: 431-440. Hehenberger, K., A. Hansson. 1997. High glucose-induced growth factor resistance in human fibroblasts can be reversed by antioxidants and protein kinase C-inhibitors. Cell Biochem. Funct. 15: 197-201. Studer, R. K., P. A. Craven, F. R. DeRubertis. 1997. Antioxidant inhibition of protein kinase C-signaled increases in transforming growth factor-β in mesangial cells. Metabolism 46: 918-925. Clement, S., A. Tasinato, D. Boscoboinik, A. Azzi. 1997. The effect of α-tocopherol on the synthesis, phosphorylation and activity of protein kinase C in smooth muscle cells after phorbol 12-myristate 13-acetate down-regulation. Eur. J. Biochem. 246: 745-749. Leitges, M., C. Schmedt, R. Guinamard, J. Davoust, S. Schaal, S. Stabel, A. Tarakhovsky. 1996. Immunodeficiency in protein kinase Cβ-deficient mice. Science 273: 788-791. Sun, Z., C. W. Arendt, W. Ellmeier, E. M. Schaeffer, M. J. Sunshine, L. Gandhi, J. Annes, D. Petrzilka, A. Kupfer, P. L. Schwartzberg, D. R. Littman. 2000. PKC-θ is required for TCR-induced NF-κB activation in mature but not immature T lymphocytes. Nature 404: 402-407. Valledor, A. F., J. Xaus, M. Comalada, C. Soler, A. Celada. 2000. Protein kinase Cε is required for the induction of mitogen-activated protein kinase phosphatase-1 in lipopolysaccharide-stimulated macrophages. J. Immunol. 164: 29-37. Aksoy, E., Z. Amraoui, S. Goriely, M. Goldman, F. Willems. 2002. Critical role of protein kinase Cε for lipopolysaccharide-induced IL-12 synthesis in monocyte-derived dendritic cells. Eur. J. Immunol. 32: 3040-3049. Carcamo, J. M., A. Pedraza, O. Borquez-Ojeda, D. W. Golde. 2002. Vitamin C suppresses TNFα-induced NFκB activation by inhibiting IκBα phosphorylation. Biochemistry 41: 12995-13002. Kyaw, M., M. Yoshizumi, K. Tsuchiya, K. Kirima, T. Tamaki. 2001. Antioxidants inhibit JNK and p38 MAPK activation but not ERK 1/2 activation by angiotensin II in rat aortic smooth muscle cells. Hypertens. Res. 24: 251-261. Seanor, K. L., J. V. Cross, S. M. Nguyen, M. Yan, D. J. Templeton. 2003. Reactive quinones differentially regulate SAPK/JNK and p38/mHOG stress kinases. Antioxid. Redox. Signal 5: 103-113. Stephens, N. G., A. Parsons, P. M. Schofield, F. Kelly, K. Cheeseman, M. J. Mitchinson. 1996. Randomized controlled trial of vitamin E in patients with coronary disease: Cambridge Heart Antioxidant Study (CHAOS). Lancet 347: 781-786. The α-Tocopherol, β Carotene Cancer Prevention Study Group 1994. The effect of vitamin E and β carotene on the incidence of lung cancer and other cancers in male smokers. N. Engl. J. Med. 330: 1029-1035. Goh, K. C., M. J. deVeer, B. R. Williams. 2000. The protein kinase PKR is required for p38 MAPK activation and the innate immune response to bacterial endotoxin. EMBO J. 19: 4292-4297. D’Acquisto, F., and S. Ghosh. 2001. PACT and PKR: turning on NF-κB in the absence of virus. Sci. STKE 2001: RE1..
Williams, B. R. 2001. Signal integration via PKR. Sci. STKE 2001: RE2..
Cachia, O., J. E. Benna, E. Pedruzzi, B. Descomps, M. A. Gougerot-Pocidalo, C. L. Leger. 1998. α-Tocopherol inhibits the respiratory burst in human monocytes: attenuation of p47phox membrane translocation and phosphorylation. J. Biol. Chem. 273: 32801-32805. Auphan, N., J. A. DiDonato, C. Rosette, A. Helmberg, M. Karin. 1995. Immunosuppression by glucocorticoids: inhibition of NF-κB activity through induction of IκB synthesis. Science 270: 286-290. De Bosscher, K., M. L. Schmitz, W. Vanden Berghe, S. Plaisance, W. Fiers, G. Haegeman. 1997. Glucocorticoid-mediated repression of nuclear factor-κB-dependent transcription involves direct interference with transactivation. Proc. Natl. Acad. Sci. USA 94: 13504-13509.